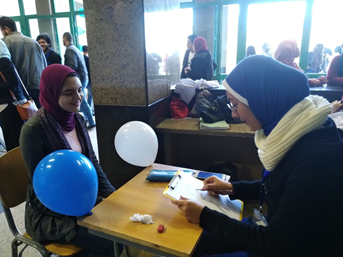 Members of Soatak Club, a student club at the faculty of Physical Therapy, conducted an opinion survey of the club’s activities. This was held on Tuesday 4/12/2018 at the first floor of the faculty of Physical Therapy from 12.30 pm to 2.30 pm. About 50 students participated in the survey. 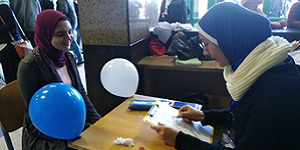 After conducting the survey, Soatak members engaged in other festive celebrations like drawing caricatures, blowing up balloons and distributing giveaways among students.